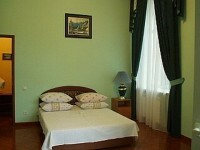 Apartments for daily rent in Yalta. This modern, stylish 1-bedroom apartment is set on the 1st floor of a 2-storey building in the central area of Yalta, just a few steps away from the Embankment, Sea port, bars, restaurants, night clubs, and within a short stroll to Massandra beaches. The apartment is designed and decorated by a professional designer. Amenities include: brand new furniture, a full, well-equipped kitchen, modern bathroom, three air-conditioners, washing machine, cable TV, broadband WiFi Internet. It will suit single travelers or families up to 5 people perfectly but it is also possible to add extra beds to accommodate larger groups. 1 bedroom apartment 50 $ / Yalta / 9 , Dmitriev Str. A luxury, specious 2-room apartment meets Western standard Air-conditionering. Private patio. 5 min walk to the sea front. 1 bedroom apartment 60 $ / Yalta / 2 , Roosevelt Str. Superb luxury, spacious apartment in the historic centre of Yalta, just steps to Yalta's Seaside Promenade. Private balcony with spectacular views of Yalta downtown. The apartment has just been renovated and furnished to a high standard. Light airy rooms with high ceilings: a large lounge area, lovely bedroom and a fully fitted kitchen. Ideal for families or business travellers. This brand-new, luxury apartment with a private entrance is located in the central area of Yalta, very close to the sea and a small beach. The apartment consists of two rooms, a modern bathroom and a well-equipped kitchen. There are two air-conditioners, a washing machine, WiFi. Maximum occupancy: up to 4 people. A 85 m2 luxury, see view apartment in a brand new, elite apartment building located in the very center of Yalta. A big private terrace offers a fascinating, panoramic sea view and a view of the Yalta seaside promenade. This top class property meets the highest quality standards. Air-conditioning in both the bedroom and lounge; two LCD TV sets; WiFi; a washing machine; 24x7 water supply and 24x7 security, car parking.